Senators met with University President Ron Liebowitz during Sunday’s Senate meeting to ask questions and voice concerns about his administration. Student Union President Hannah Brown ’19, who also attended the meeting, noted that this was Liebowitz’s first time attending a Senate Meeting during her tenure at Brandeis. Liebowitz mostly reiterated the points made in his Oct. 29 address on his plans for the University’s future, explaining that the greatest challenge Brandeis faces at the moment is “financial.” At one point, Liebowitz said he was frustrated that meal plans are mandatory for students living on-campus, earning audible agreement from many senators. Village and 567 Quad Senator Jake Rong ’21 said he wanted more channels of communication between the student body and the Board of Trustees. “It doesn’t seem like there are many opportunities for students to interact with the Board of Trustees [right now],” Rong said. Liebowitz explained that the Board of Trustees is composed of people from around the world, which makes it exceedingly difficult to plan times for them to meet with students. In response to editorials published in the Justice and the Hoot last week, Brown announced that the University will dedicate a discussion in its “Campus Conversation” series to a forum on accessibility. The open forum will tentatively be held in the week of Dec. 3. It is unclear whether an existing “Campus Conversation” was already planned to discuss accessibility on campus, or if the open forum was created because of the circulation of a petition organized by Addressing Accessibility at Brandeis. After Liebowitz left, Student Union Vice President Benedikt Reynolds ’19 announced at Sunday’s meeting that he will be stepping down as Vice President for personal health reasons at the end of the semester. This will prompt a special election for his position, and the Student Union secretary will send an announcement regarding winter elections and open positions on Nov. 26. Winter elections will be held on Dec. 10, Class of 2019 Senator Kent Dinlenc said after the meeting. On Thursday, Executive Senator Aaron Finkel ’20 debuted two amendments to the Student Union Constitution designed to check the power of the Allocations Board. The amendments were the result of Finkel’s stated intention at last week’s meeting to address the “checks and balances” between the branches of the Student Union. Finkel’s first proposed amendment would expand the president’s powers and allow the president to veto decisions “at any time.” This proposed amendment would also allow the president to veto “any Marathon, Emergency Funding, or Appeals decision.” Per Finkel’s draft amendment, the only way for such a veto to be overturned would be by a two-thirds majority vote in the Senate. The amendment would likewise grant the Senate a “Senatorial veto” with the same rules and restrictions as the President’s proposed veto power described above. The Senate would need a two-thirds majority vote to use a “Senatorial veto” on an A-Board decision. The Union president would have the power to overturn any Senatorial vetoes. The second of Finkel’s proposed amendments would further check the power of the A-Board. This would require that the Senate approve all rules of order and policies established by A-Board prior to the implementation of those rules and policies. This amendment remained unchanged after Sunday’s Senate meeting. At the meeting, Finkel announced that he was revising the first of his two proposed amendments to the Union Constitution after discussing the matter with a constituent earlier on Sunday. “Someone suggested today that we take out that second part of [the first proposed amendment],” Finkel said, explaining that he would reflect this change by removing the Senatorial veto, keeping the rest of the amendment intact. Finkel then transitioned to his weekly report on the state of the Senate Services and Outreach Committee, where he announced that he had gotten approval from the Union’s Executive Board to run shuttles from Boston Logan International Airport to Brandeis campus for students returning to campus after the winter break. Finkel assured senators that “we won’t have to use Senate money for this.” Finkel said that Public Safety agreed to contribute $150 to the project, which is expected to cost $1,200. Senator Joshua Hoffman ’20 asked the Senate to vote on a Senate Money Resolution that would allocate $80 to buy and distribute 800 condoms throughout the first-year quads. Another senator asked Hoffman to increase funding for the SMR in order to distribute condoms in the Foster Mods. Hoffman modified the SMR to request an additional $5 for condoms for the area and made a motion to vote on the SMR. International Student Senator Linfei Yang ’20 objected to Hoffman’s resolution, asking him to “explain the urgency” of the resolution. This was the second motion in the past three weeks that Yang has objected to for that same reason. Hoffman’s SMR was passed in a vote of acclamation. Finkel then walked senators through the Senate Money Resolution to allocate funds for the fall semester Midnight Buffet. The resolution, which totals roughly $8000, included $3500 to be spent on food and beverages, $300 to be spent hiring a DJ, $478.78 to be spent on decorations and $2,212 to be spent on t-shirts. Yang objected to the motion to vote on the Midnight Buffet SMR but declined to explain why. The resolution was passed in a vote by roll call; all senators present for the meeting supported the resolution except Yang, who abstained. Next, the Senate voted unanimously to remove Allocations Board chair Aseem Kumar ’20 from the E-Board after five unexcused absences from meetings. Members are only allowed three. Class of 2019 Senator and Representative to A-Board Vidit Dhawan said Kumar told him that he was not interested in being on E-Board in the first place. Brown nominated Executive Senator Andrea Deng ’21 to become a Senate liaison to the E-Board. Dinlenc said the addition of another senator to E-Board meetings was unnecessary. Reynolds said Deng would be a different representative to the E-Board than either of the senators who currently attend E-Board meetings — Chief of Staff Finkel and Vice President Reynolds. Senators voted to appoint Deng by roll call. Senators Dinlenc, Dhawan and Richard Kisack Jr. ’19 voted against the appointment. By a majority, Deng was appointed to the E-Board for the purpose of communicating the content of E-Board meetings back to the Senate. Finally, two representatives from Brandeis Climate Justice, Maya Kattler-Gold ’21 and Claudia Davis ’19, presented to the Senate to gain support of a measure to encourage the University to divest from fossil fuels. 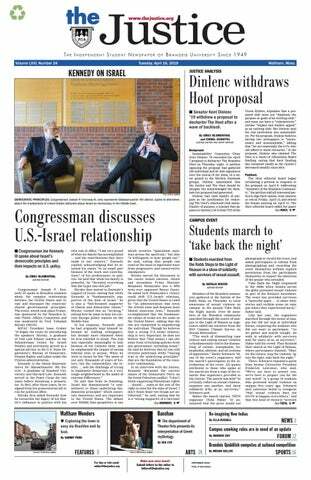 Hoffman asked the duo if divestment would hurt the University financially in the short term. The representatives replied that “you can’t be sure of the math,” and argued that fossil fuel stocks are volatile, and that any money the University might lose through divestment would also likely be lost due to the volatility of its investment. After discussing whether the motion of support would be approved by the Senate only or the Student Union as a whole, those present agreed that the endorsement would come from the Senate only. The motion was passed with total support save for an abstention from Rong. —Kent Dinlenc is a staff writer for the Justice.